Air-permeable drypads feature a patented SuperCore absorbent that draws in moisture, locks it away from the skin and feels dry to the touch in just minutes. * Lies flat when wet thanks to SuperCore technology, without bunching, swelling or disintegrating. The AquaShield film provides leakage protection that means fewer linen change, no double-padding needed! 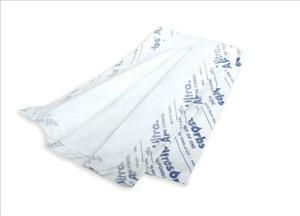 Air permeable for added comfort, dryness and no embarrassing plastic film crinkling. Effective for use with low-air-loss mattress therapy; protects the bedding and permits airflow. Indications: Open air continence management, ICU/CCU patients who should not be moved or disturbed, ER/OR for absorbing significant or ongoing fluid loss and any place where skin dryness is needed. 10 pads per bag.